We’re spoiled in Seattle, awash in food options that hail from every corner of the Asian continent; a city that seemingly has a teriyaki joint on every corner. But for families looking to broaden kids’ palates for Asian fare, Korean offers a fitting gateway cuisine. Why? While Korea’s de facto cultural dish, kimchi, can pack a spicy and sour punch, lots of other offerings have a milder, often sweet flavor profile. Rice- and noodle-based dishes, soups, barbecued meat, dumplings and savory pancakes abound. Plus, kids will love the hands-on experience of cooking your own barbecue with portable grills brought tableside or tables with built-in grills. This is food that’s meant to be shared and typically comes all at once, rather than in courses, though usually, everyone gets their own bap, or rice. Our family’s go-to Shoreline spot serves its bap in little individual metal bowls with lids, which the kids love. One of the best parts of a Korean meal is banchan, a myriad assortment of little side dishes that will arrive at your table without your asking, and — happily — can be refilled upon request after you’ve inhaled the first round. Some flavors and textures may be off-putting to kids who haven’t been raised on them; my children still won’t eat one of my faves, stir-fried dried tiny anchovies (myulchi bokkeum), even though they’re almost candy sweet. But there are many kid-friendly banchan, including soy sauce and sesame potatoes (gamja jorim), rolled omelet (gyeranjjim or gyeranmari), soybean sprouts (I’ve never seen my son slurp up a vegetable so quickly or enthusiastically as kong namul), sesame spinach (shigumchi namul), fiddlehead fern (gosari namul) and simmered tofu (dubu jolim). 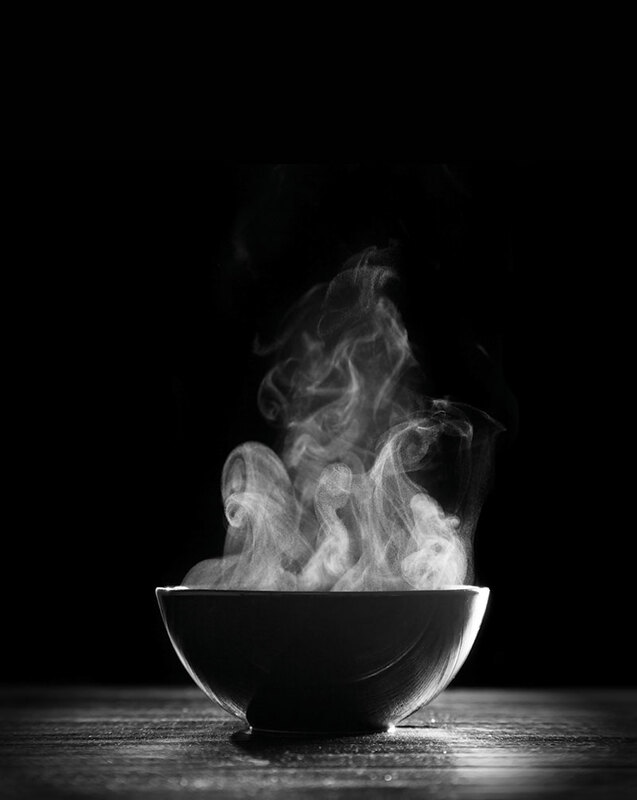 You may also be brought steaming mugs of roasted barley tea, or boricha (caffeine-free, so your kids won’t be buzzing if they glug it down), and a bowl of simple soup broth. But back to that kimchi for a minute. Its seasoned vegetables and salt can be fresh, like salad, or fermented, and it can be served as both a condiment and an ingredient in other dishes. Koreans eat the staple at pretty much every meal. And while the typical napa cabbage kimchi containers sold at Uwajimaya and other Asian grocery stores are the hue of red-hot chiles, not all kimchi is spicy. (When it is, I’ve been known to discreetly rinse it in a glass of water to make those salty, crunchy veggies more palatable for the kids.) In her terrific cookbook Eating Korean, author Cecilia Hae-Jin Lee cites the Korean Food Research Institute as logging just under 200 varieties of kimchi, with loads of regional specialties spotlighting everything from radish and mustard leaf to leek, persimmon and squash to garlic stalk and abalone. See the accompanying glossary (below) for some kid-pleasing dishes to try. And even if you don’t plan to cook Korean at home, Lee’s book is worth reading for her personal stories and cultural nuggets that are interspersed among the recipes. Another Korean cooking star, Maangchi (dubbed “YouTube’s Korean Julia Child” by The New York Times), has a cookbook out in addition to her popular YouTube shows, which share insights into dishes. This self-described “fast casual” restaurant, with about 10 tables, is like the Chipotle of bi bim bap. The food is filling, cheap and arrives quickly (good for impatient tots). Choose white, brown or multigrain rice, pick your protein and you’re off. Plus, it offers a few other kid-friendly staples, such as japchae, mandu and the decidedly nontraditional Korean tacos. A good all-around dinner spot (Saturday is the only day it’s open for lunch), Kimchi House has a relatively small menu: Don’t expect a wide array of banchan served in the traditional style. If your kids still refuse to try kimchi, your secret weapon is its kimchi fries (cheese, sour cream, kimchi and mayo made with Korean red chili paste). Or kimchi fried rice, or its non-spicy water kimchi. And there is lots of kimchi to take home, too. Try the tasty soondubu as well. KFC is not just Colonel Sanders’ purview. Korean-fried chicken is addictive, especially Stone Korean’s marinated, sweet-and-spicy version dish done well. (Note: While the order runs $18 or higher, it feeds at least two.) You can also order non-spicy KFC. While you’re there, try the Korean cold noodles, naengmyeon (akin to Japanese soba), made from arrowroot. Comfy booths abound. Known for its mild, long-simmered beef soup and all-you-can-eat barbecue fired up at recessed in-table grills, this Lynnwood spot offers barbecued meat, including pork belly, brisket, marinated chicken and sliced beef, along with excellent bulgogi. All-you-can-eat service is popular and table waits can be long. This long-established Korean eatery is famous for its soft tofu soup, or soondubu, of which it lists more than a half-dozen versions, from clam and fish roe to mushrooms with beef to vegetarian style. (Tip: Mix in the egg right away so it cooks thoroughly.) If you like seafood, try the thick, creamy rice noodles with mussels, squid, shrimp and veggies. My family’s go-to spot is tucked into one of the seemingly endless Aurora Avenue strip malls. Don’t miss the great, fresh banchan and, if you can handle heat, try the spicy baby octopus. The kids like to threaten to press the tableside button that summons a server. Be warned: The large TV near the kitchen is usually on and tuned (appropriately) to a Korean-language channel. If you have a big group, nab a table in one of the private rooms, which feature traditional low tables (ditch your shoes at the door). The straightforward name says it all: Soup’s on, perfect for a chilly damp day. (The restaurant name is the English translation of the cloudy, slow-cooked beef soup sul lung tang.) Add some green onions, chiles, salt and kimchi to taste. If the kids shy away from the beef soup, order the spot-on mandu soup. The menu is smaller than those of many Korean places, but it’s solid. Pot stickers and the seafood pancake are super yummy. The dark-wood restaurant is cozy, with loads of booths. The kids will like the purple-hued rice. Here are key Korean dishes to know (English spellings often vary from place to place). Helpfully, many Korean menus include photos of dishes too. 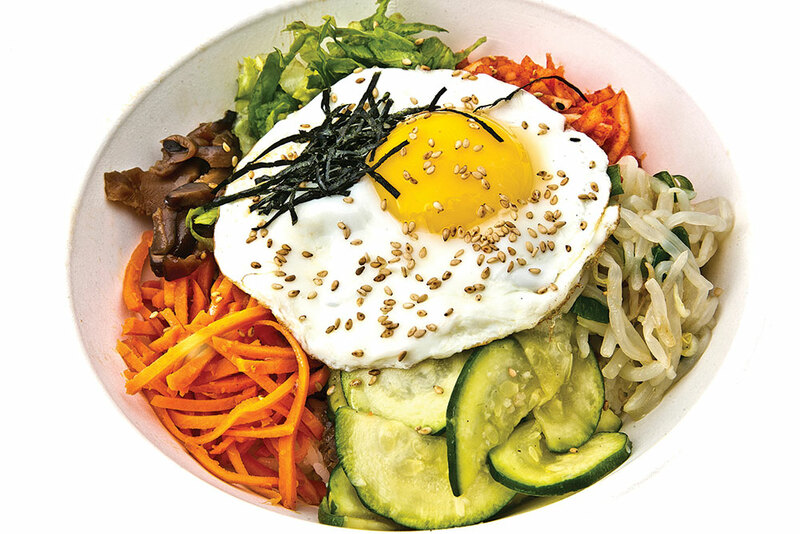 Bi bim bap:Mixed rice topped with vegetables and meat or tofu and often a fried egg, served in a regular bowl or a hot stone pot (making it dol sot bi bim bop). The stone pot makes a crispy, yummy rice crust at the bottom. The spice-averse should ask for chili sauce on the side. Bulgogi:Grilled beef, often sirloin, marinated with soy sauce and mild spices. Generally grilled over an open flame, it is also sometimes made with pork (dwaeji bulgogi) or chicken (dak bulgogi). 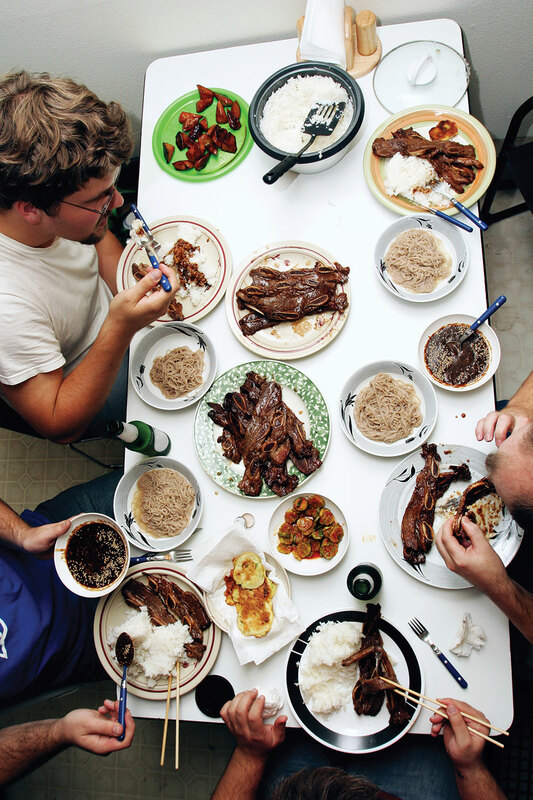 Galbi or kalbi:Beef short ribs marinated with soy sauce, garlic and sugar, sometimes with sesame oil or chili paste. Often served with lettuce or other leafy greens for wraps, keeping toddlers’ hands busy. 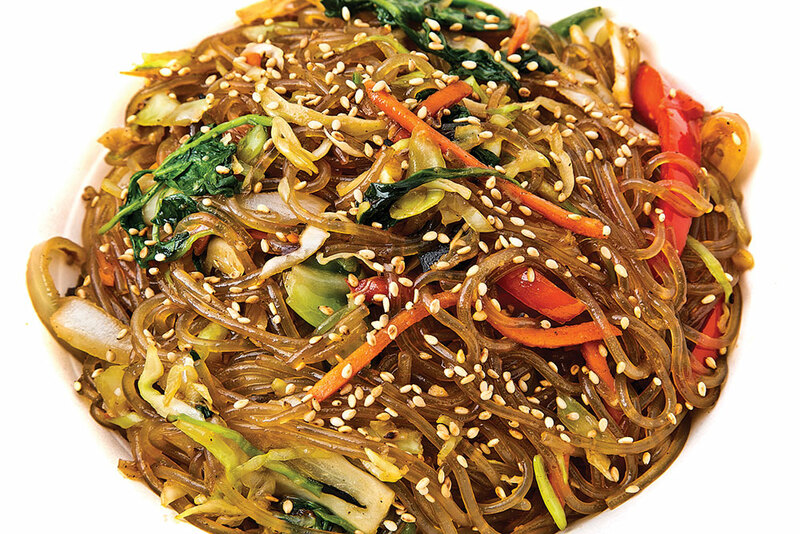 Japchae:Sweet potato noodles (translucent, chewy and slightly sweet) stir-fried with vegetables (often mushrooms, spinach, bell peppers) and beef. Juk or gook: A slow-boiled rice porridge (sometimes made with other grains) cooked with a seemingly endless array of meat, seafood or vegetables. Try dakjuk, a Korean-style chicken and rice porridge; jatjuk, a pine nut porridge; or miyuk gook, a seaweed porridge. Jun, jeon or buchingae:Flat cakes or pancakes commonly studded with vegetables (such as mung bean sprouts or green onions) or seafood. Mandu or mandoo:Pan-fried dumplings traditionally made with pork (some restaurants may offer vegetarian tofu versions). When served in soup, they are steamed, not fried. Soondubu: Soft, silky tofu, often cooked in a stone pot, served bubbling hot with seafood, meat or veggies and with a red tinge from the chili powder. Note: Only for kids who like spice.